I have converted my first pdf into a kindle format (Books and Therapies for Healing Chronic Illness and Trauma) and am looking forward to getting the others converted over the next few months (and hopefully sooner). I delayed sending this new blog post notification for a day because it was not possible to upload the kindle file to my email service. I’ve contacted customer support so if it’s possible to do so I’ll include it in a future email. For the time being you can download the kindle version from the bottom of this week’s blog post by entering your email. It’s still free like everything else. I have put links to the other free pdf downloadables I have in today’s post at the bottom of the email. On to the blog post ! These are the most common questions I get from readers about chronic illness and trauma symptoms. The answers explain why traditional treatments leave some of us with side effects or complications more often than others. Why it’s harder for some of us to recover after seemingly minor stressors or accidents. And why healing the past is worth it. This will widen your options, give you new tools for healing, and – if you feel like you’ve got nowhere else to go with your health – help you get unstuck. Hover over reference numbers in parentheses to see more information. If the hover function doesn’t work, see the reference number at the bottom of the post for the full text. 1. Can ACEs (adverse childhood experiences) or other kinds of trauma make one more prone not just to developing chronic illness but more likely to suffer mental illness or chronic pain (or addictions, obesity or other health conditions)? A. Yes. Hundreds of ACE studies show that 10 different types of trauma are risk factors for just about every kind of chronic health problem. Here’s a post on the ACE studies relevant to chronic illness where you can also take the ACE survey, and a post with lists of the different effects of ACES, books and resources on ACEs, and a downloadable 1 page ACE fact sheet to give your doctor. In addition, a large body of evidence and scores of studies show that other kinds of trauma in childhood and at other times in our lives also increase risk for many chronic illnesses and other health conditions (see Chapter 5 in The Essential Guide). 2. Does a history of trauma mean my chronic illness, mental illness or other symptom is psychological? A. No. While thoughts and emotions can affect our bodies and health, the effects of trauma go well beyond psychological symptoms and PTSD. Trauma also shapes how our nervous system and immune systems function, influences which genes turn on and off and to what extent, and alters physiology and how cells function. This includes metabolism, blood pressure, heart rate, temperature, digestion, clotting, and much more. Having a chronic health problem is not your fault, is not because you are lazy or weak, and is not due to a personality flaw. It’s about the scientific discovery that life experiences interact with our genes to shape long-term health (1), (2), (3), (4), (5). 3. Can ACEs or other types of trauma cause symptoms as a result of any (banal or not) physical trauma or illness? A. Yes. The effects of trauma add up over time to make us more sensitive to all kinds of stressors and to reminders of past traumas. Stressors and traumas that happen throughout life, including illness and infections, can trigger flares or the onset of new symptoms when we have a history of prior adversity. 4. Why do some people recover well and get helped by whatever treatment they try when others suffer chronic pain (or other symptoms) as a consequence of much less severe accidents or similar medical treatment? In the blog post you can hover over the reference number to see a more detailed reader question (6). A. This makes sense in the context of trauma. Trauma changes our brains and physiology gradually over years. It also makes us more sensitive to stress and later trauma. Many medical procedures, for example, are invasive or at the very least stressful, and can feel threatening, especially if we have a history of trauma. Here’s how trauma affects risk for side effects and complications. 5. Are people like me – who suffered trauma a long time ago or whose parents were traumatized – doomed to suffer forever or is there a way to detraumatize the brain and turn the healing switch on? In the blog post you can hover over the reference for a reader’s more detailed question (7). A. You are not doomed, it really is possible to detraumatize our brains. The science of trauma not only explains how our brains and physiologies change to cause symptoms – it also shows how our brains and nervous systems are designed to heal. And healing can happen even if trauma happened decades ago, in your parents or grandparents’ lives, or during pregnancy and birth. Many kinds of well informed approaches exist that support healing the effects of trauma. Here’s a list of helpful, insightful and inspiring books on trauma and healing and of trauma therapies with links to websites to help you find a therapist. I hope that helps!! 6. How are you doing? Do you really see improvement in your physical health as a result of trauma work? A. Yes. I am much improved. It’s been a slow process that has taken place over many years and is still ongoing, but I’ve gone from being mostly bedridden to quite active. Here’s my story. 7. Do you know of others who have been helped in a significant way with trauma work? A. Yes. Here’s how healing trauma has cured or improved asthma in children. And here’s a free excerpt from ebook #1: An Overview of The Chronic Illness and Trauma Connection, summarizing stories of people who have improved or recovered from MS, inflammatory bowel disease (IBD), chronic fatigue aka ME/CFS, Parkinson’s, Guillain Barre and a blood disorder, and asthma. Not all recoveries happened as a result of trauma therapy but once you understand how trauma affects the nervous system, you can see how a multitude of approaches exist that can make a difference. 8. If it’s not psychological, how (and why) does trauma therapy work? 9. What would you recommend to a person who needs help but has no access to therapies (due to location, cost, etc)? A. More and more therapists do sessions by phone or through the internet, and many also offer a sliding scale to help with cost. You can also find ways of working with trauma in these books on chronic illness and trauma symptoms. 10. Is there a self-help program or online program that can be just as effective in getting started with this? A. Yes. See this list of of books for working on yourself as one place to start. If you are a coach, therapist or have some familiarity with trauma and the nervous system take a look at Organic Intelligence “Basics.” Steve was my favorite faculty when I trained as a trauma therapist [somatic experiencing (SE) faculty] and I can’t say enough good things about him, his approach or his teaching style. If concepts about the nervous system, chronic illness and trauma symptoms are new to you, watch Irene Lyon’s free videos on youtube. You may want to take one of her online courses (see under “programs” on her website). She has a big focus on chronic illness and is also trained in SE. I hear many good things about her and her work although I don’t know her personally. 11. I have tried many things, lost so much money – and time – and gotten nowhere (13). Is it really possible to undo something that has been years or decades in the making and has become such an intrinsic part of my being? A. Yes, it really is possible. Working with trauma is not easy. But I’ve found that when the pain of my chronic illness and trauma symptoms become greater than the fear of old trauma, I have more capacity to deal with healing the pain of the past. And that it helps. 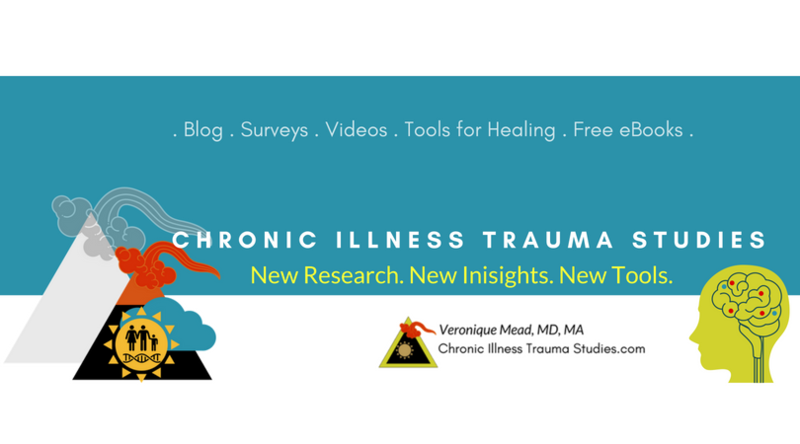 Working with links between chronic illness and trauma symptoms often takes time, especially if you have a physical disease, which evolves outside of our conscious awareness over many years before onset. It can also take time before you see results in your physical health. This is especially true if you experienced more intense trauma or if you were exposed to adversity over a long period of time (such as growing up with a depressed, alcoholic, emotionally distant, or abusive parent). The process of healing has been much slower than I ever expected myself, although that’s not the case for everyone. I speak from personal experiences with my own health as well as from work with clients, readers who write in, the research, and other stories I’ve been told. Here are tools, resources, books and therapies to start with. 12. Have you considered treatment “x” (insert name of treatment here) as a way to recover from chronic illness and trauma symptoms or release what has been suppressed? A. I have personally tried many things (14) although I have not tried medical treatments. This is in part because of how many side effects I’ve experienced with what I’ve already tried (see #4). It’s also because there is no known cure for my chronic illness (I have chronic fatigue aka ME/CFS). And it’s because, as a doctor, I saw how little we know about treatments that address symptoms without curing the underlying cause. My interest has long been the trauma route. Perhaps because it enables me to trust myself, my impulses, my own body and to listen for what is true for me. And because healing trauma is helping me and I can see the deep changes happening. Also because the science keeps pointing in this direction too. 13. Can you recommend a therapist? A. Look for a trauma therapist in therapies for healing nervous responses to stress, trauma and perceptions of threat. 14. Do you have any tips for healing the parasympathetic freeze response / getting the parasympathetic social nervous system back on board? A. These somatically based trauma therapies are designed for this very thing as are most of these tools. Allowing yourself to spend time with soothing or pleasurable resources is also a way of accessing the ventral vagal / social nervous system, which can help regulate fight, flight and freeze responses. You can read Love 2.0 to learn more and see my colleague Dr. Arielle Schwartz’ post on yoga and other ways to stimulate the vagus. 15. Do I really need to deal with old trauma? It’s in the past so it seems there’s nothing I can about it but move on. A. Good question. Trauma can be like a wound that is filled with pus. It gets red, sore and leaks yellow stuff. If we don’t open up the abscess to let the infection out, it can trigger a much bigger infection and whole body reaction. And the abscess can’t actually heal. The pain of trauma is like an abscess. When unresolved, it prevents our nervous systems from being in the present, which is where our psyches and bodies need to be in order to heal. The good news is that resources, connection (with friends / nature / hobbies / music, see more in ebook #1), and other things that help us feel even one iota of pleasure are hugely supportive of healing. This is because our brains and bodies are designed to recover from trauma. And sometimes that’s all we need to do: take time and make room for resources. If that’s not enough – when changing your diet, leaving the stressful job or relationship, exercising to whatever extent you can, doing self care, meditating, doing yoga or tai chi, de-stressing, resourcing and more are not enough to make you better or feel better – healing trauma can help. These somatically based trauma therapies are just one set of approaches that can be helpful with that. Lansing the trauma abscess is only painful in the short term. Once it heals your emotional and physical symptoms can begin to improve. And you feel more whole, experience more joy, feel more connected, and can live your life more fully. * Is it ok for me to share your info on social media? A. That is wonderful! I just ask that you don’t give away any of my ebooks, pdfs and other documents that you may have downloaded from my blog or from emails I’ve sent you. These are all available for free in exchange for an email and help me grow my readership. * Are your books available in a kindle-friendly format? A. YES! You can now get Books and Therapies for your kindle (see below). I hope to convert all my longer downloadables over the next few months. I will attach them in an email to those of you who follow me on my blog (subscribers) as they become available and you can also just check back once in a while on my free downloads page to see what’s been updated.